A team of New York architects has proposed a ring of shipping containers full of trash to protect Manhattan’s shores from future flooding. Aptly named [CONTAINED], the project would dispose of the city’s trash, protect it from impending superstorms and even be topped with a floating mini city. Designed by Arianna Armelli, David Sepulveda and Ishaan Kumar, the storm-proofing concept was created for the ONE Prize contest. The first layer of the project would be a deep canal trench dug around Manhattan’s shoreline. The canal would be lined with shipping containers, filled with garbage, and hopefully sealed to prevent leaking. The team would sort the trash used, only depositing non-toxic, unrecyclable materials within the storage containers. The storage containers would act as a flood gate, holding storm surges back from reaching the shore during storms and floods. Beyond flood prevention, the team envisions using the floodgates as a way to create a new shoreline for locals. Businesses, retail centers or even residences could floating on top of the layer of shipping containers, creating an off-shore city accessible by boat. [CONTAINED] imagines container villages geared toward the working class, to give them access to waterfront views that currently may not be able to enjoy. Ultimately, [CONTAINED] was deemed too radical and sadly did not place in the ONE Prize contest, but the team does raise an interesting possibility of creating an artificial reef/barrier to help divert flood waters. The one problem I see with using the shippping containers is that they are generally made from steel and steel corrodes especially in a saltwater environment. In addition, steel usually does not like to corrode evenly, but corrodes by pit corrosion - concentrated in isolated areas of the shipping containers. So, it is quite likely you would have leaking shipping containers within a decade or two, unless you can eliminate all oxygen from the metal or cathodically protect each container which is not likely. 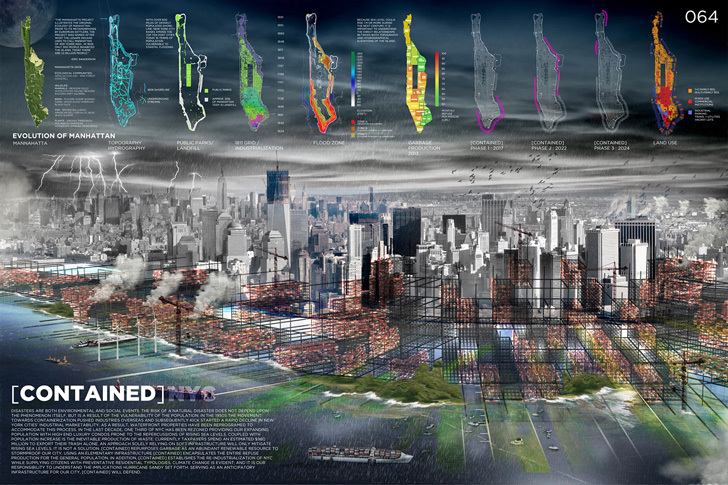 The first layer of the project would be a deep canal trench dug around Manhattan’s shoreline. The canal would be lined with shipping containers, filled with garbage, and hopefully sealed to prevent contaminants leaking. The team would sort trash, only depositing non-toxic, unrecyclable materials within the storage containers. The storage containers would act as a flood gate, holding back storm surge from reaching the shore during storms and flooding season. Beyond the flood prevention, the team envisions using the floodgates as a way to create a new shoreline for locals. Floating on top of the layer of shipping containers could be businesses, retail centers or even residences, creating an off-shore city accessible by boat. [CONTAINED] imagines container villages geared toward the working class, whose shoreline views have been cut by the influx of luxury high rises. The [CONTAINED] concept was deemed too radical, and sadly did not place in the ONE Prize contest, but the team does raise an interesting issue of creating an artificial reef/barrier to help divert flood waters.